On the following pages you can find a lot of information about my cars in general and about 1958 and 1967 Cadillacs in special. You can find information about the cars history, find vintage ads, color charts and technical data. I also feature all the restoration work done on my cars here. You can watch tons of pictures and find lots of info. Click on the car to go to the cars various pages. All the info about the 1958 Cadillac Eldorado Seville can be found here. My cars history, the Restoration, available Colors and Interiors including codes, available Options and much more. Click the button for more info! The 1967 Cadillac DeVille was the very first car I bought. It started my passion for Cadillacs. Find all the info about it here. You also get detailed info about its restoration and more info about 67 Cadillac in general. 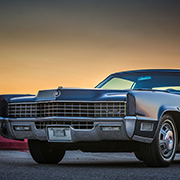 The 1967 Cadillac Eldorado is one of the most beautiful cars Cadillac ever built IMHO. Here you can find all the info, pictures and details about the 1967 Eldorados including a very detailed article on its history. I love Cadilllacs, but there are also some great Lincolns out there. I always wanted to own at least one, so I chose a Mark III. You can find some interesting facts and some great pictures of this super nice Lincoln here. The last BIG Eldorado produced. In 1979 the Eldorado line was downsized considerably. This car was always collector owned and is a very low mileage survivor in like new condition. Check out great pictures! I think that Persian Lime is the most spectacular color GM put on their cars in the 1970s. It looks spectacular on this low mileage beauty. The color was the reason why I wanted this car. Check out the work I did to make it look perfect again.